PIERRE, S.D.—The first-ever biography of internationally known children’s author and illustrator Paul Goble, who passed away on Jan. 5, has been released by the South Dakota State Historical Society. Written by Gregory Bryan, “Paul Goble, Storyteller” captures a life that few Americans are familiar with. 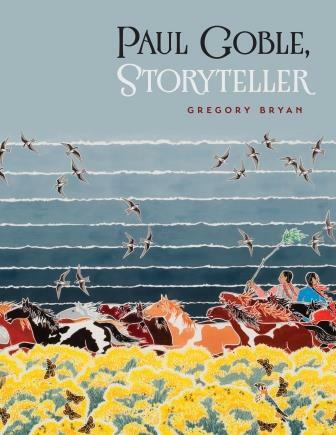 In writing “Paul Goble, Storyteller,” Bryan interviewed Goble, his family, friends and those whose work he influenced to tell the artist’s story, including Lakota artist and author S.D. Nelson. As Bryan records, Nelson acquired the courage to begin illustrating and writing his own stories after reading Goble’s “The Girl Who Loved Wild Horses,” which won the prestigious Caldecott Medal in 1979. “Paul Goble, Storyteller” is also richly illustrated with the artist’s works and features stories about his creative process in writing, designing and illustrating his bestselling books. Goble’s artwork is located in collections and institutions throughout the country, including the Library of Congress and the South Dakota Art Museum. Goble wrote and illustrated more than 40 books for children. Bryan is a professor of education at the University of Manitoba, specializing in literacy education and children’s literature. Born and raised in Australia, Bryan lives in Winnipeg with his wife and their two children. “Paul Goble, Storyteller” can be ordered for $29.95, plus shipping and tax, directly from the South Dakota Historical Society Press. Visit sdhspress.com or call (605) 773-6009. The book is also available through most bookstores and online retailers. For publicity information or to schedule an interview or event with the author, contact Jennifer.mcintyre@state.sd.us. Events celebrating Goble’s life and work as well as the release of “Paul Goble, Storyteller” will be held at the South Dakota Art Museum in Brookings on Jan. 19, 5-7 p.m.; and the Journey Museum, Jan 20., 5:30 p.m., and at Prairie Edge Trading Co., Jan. 21, 11 a.m.-2 p.m., both in Rapid City. All times local.